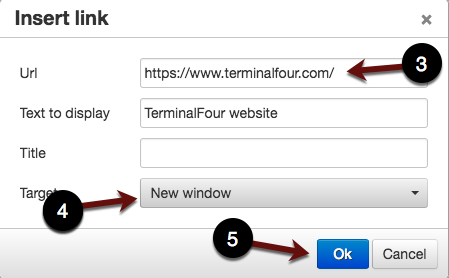 These instructions will discuss the different types of links you can create within TerminalFour. NOTE: Because you add links within content editing, these instructions are the same for both Direct Edit and Site Structure. 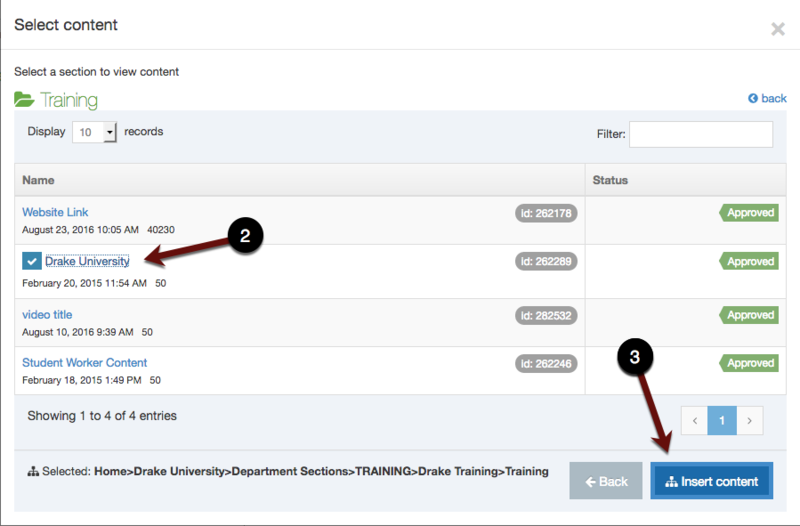 Content links go to specific pieces of content on sections (pages) within the Drake website. External links are used for either linking to external websites, or inserting email links. Anchors are used to jump to a particular spot within a piece of content. In the main body, put your cursor where you want the section or content link to appear. Click the Link icon in the top row of the tool bar and select either Insert section link or Insert content link depending on what you are trying to do. A pop up box will show up asking you to Select section. Once you select the section you are trying to link to, scroll to the bottom of the site structure list, and click Select section. It will show the path to the section. If you're trying to link to content, once you've selected the section, you'll have to also indicate which content you want to link to by clicking View content. A pop up window will show up to Select content. Select the piece of content and it will have a check mark next to it. Click Insert content. Be sure to save your changes when you're done. You will now see a link with the content link in your section. In the main body, type the text that you would like to appear as an email or external website link. Highlight the text that you want to use as the link. NOTE: Be sure to use text that indicates where the link is taking them, rather than something generic like Click here. 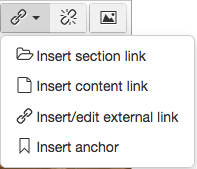 Click the Link icon in the top row of the tool bar and select Insert/edit external link. In the pop up box, enter the URL of the website or the email address you want the link to go to. If you're making a link to a website, be sure to select New window in the Target field. This will allow users to return to their initial website page when they finish visiting the link. Be sure to save, once you have, you will now see a link with the display text in your content. 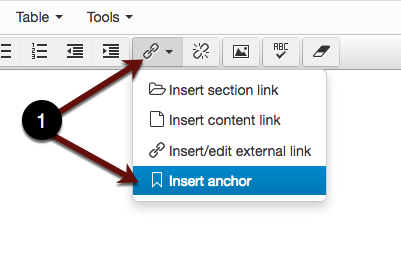 Click the Link icon in the top row of the tool bar and select Insert anchor. Name your anchor (each anchor must have a unique name) and click Ok.
You'll now see a tiny anchor symbol in your content where your cursor was. Create the anchor link text and highlight it. 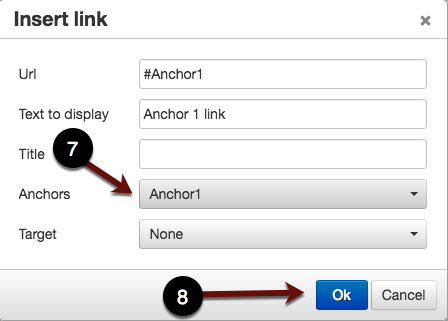 In the pop up window, select the anchor you want to link to from the Anchor field menu. You'll now see a link where you had highlighted your text.